The Théâtre français de Toronto is offering Torontonians with a knowledge of French the chance to see an acclaimed play written and directed by the Algerian author Slimane Benaïssa. The theme of "Prophètes sans dieu" from 1998 could hardly be more pertinent: "Why are Judaism, Christianity and Islam, all of which preach peace, always at war?" Even if the play does not answer the question, it provides an intriguing perspective on what the three religions share in common. 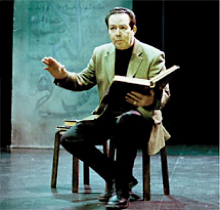 The play concerns a playwright (played by Sliman Benaïssa himself) who has had a lifelong fascination with the three holy books of the West--the Torah, the Bible and the Koran. He has always been curious about the profession of prophet and the lack of peace their teachings seem to have engendered and so summons a meeting of Moses, Jesus and Mohammed. First Moses, then Jesus appears and immediately they begin to provoke each other about the differing points of their belief. Jesus tells Moses his journey was horizontal whereas his own was vertical, contrasting Moses' freeing of the Israelites and leading them on a journey to the Promised Land as opposed to Jesus' sacrifice leading mankind from earth to heaven. Even in their good-natured arguments they notes similar patterns in their lives. Moses was discovered in the rushes by the Pharaoh's daughter, Jesus in the manger by the Three Magi; both faced wanderings in the desert; both performed miracles; both want to lead people to a better life. The difficulties come when it is clear that Mohammed will not appear to join their discussion. The playwright must explain that in Islam it is forbidden to represent Mohammed in a figurative fashion, especially not on stage, and that Islam forbids even thinking of Mohammed in doing anything not already described in the Koran. Naturally, Moses and Jesus want to know how it is that they can appear on stage, to which the playwright says that Judaism and Christianity have place no interdiction of presents them as figures and what is more, in a revelation astounding to them, they are his creations! In a key passage the author tells Moses and Jesus that he is a "prophet without a god" (as in the title). Religious prophets tell stories about God to man, while authors tell stories about man to men. That's the difference between religion and theatre. This coup de théâtre reveals the play as cross between Pirandello's "Six Characters in Search of an Author" and Lessing's "Nathan the Wise". In saying that Jesus and Moses are each his creations, the author provides a response for why different religions exists. Each prophet came back with a different revelation because each asked God a different question. As the author playing the Author, Slimane Benaïssa projects an appealing aura of childlike innocence even when he reveals his control of the events. Louis-Basile Samier creates a warmly human portrait of Moses, much like a beloved grandfather than the overwrought Cecil B. DeMille hero. Gérald Châtelain's Jesus is not what you would expect. He is a strongly built man in late middle age with an intense stare but hardly the pallid, gentle young man of familiar iconography. Châtelain's rapid-fire delivery further underscores his characterization of Jesus as an inflexible ideologue. There's no question that the humbler Moses with the greater sense of humour is more appealing. The play features musical interludes drawn from the medieval musical traditions of each religion. Singer Magali Paliès has a rich, strong voice and Jalil Charraf accompanies her on the violin. Emmanuelle Sachet's minimalist design involves only three coloured panels, with inscriptions to represent each religion and a number of low stools. Given the spareness, it is up to Pierre Bergan's highly inventive lighting to create different spaces and realities on stage. Isolating the Author in light with darkness all around helps to reinforce the others as products of his imagination and by extension prophets of world religion as products of God's. This is a simple, humorous and thought-provoking work that emanates a strong sense of humanism and a respect for all three religions. All three religions take Abraham as their patriarch. If only an awareness of this commonality and sense of complementarity could pervade the discourse in the outside world as its does for 90 short minutes in the theatre.